To verify that the phi ratio is fractal-holographic in nature it should be possible to use any node on the phi spiral as the center point around which the spiral is rotated and observe the same boundary condition phenomenon arising exactly 3 nodes out from the center. This is in fact the case. 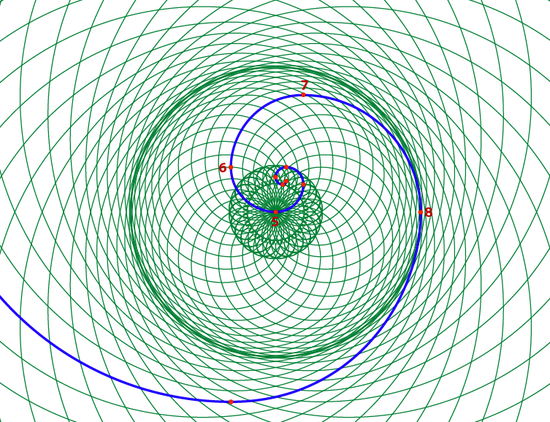 Illustration 6 shows the same spiral as in Illustration 5, this time spun with Node 5 as the center point rather than Node 4. A boundary arises exactly at Node 8. 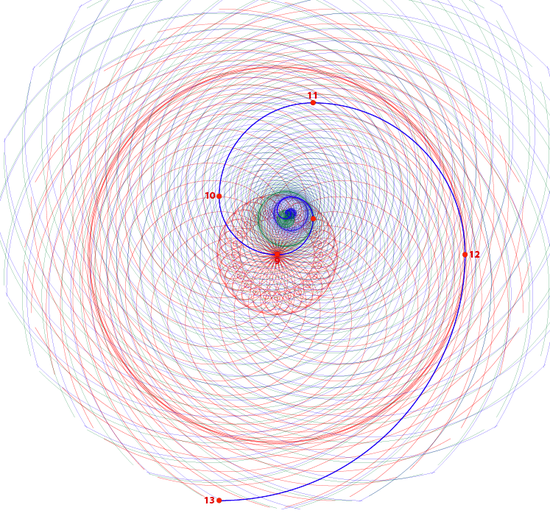 Illustration 7 shows three double spirals, all created from one 13-node source spiral, with each one centered on a different node (red at Node 9, green at Node 5, and blue at Node 4). Notice how the source spiral is common to all three; if you trace the path of the source spiral it is present in each individual double spiral as well as seamlessly continuous in itself — ergo holographic. And of course, each iteration of the double spiral field pattern is a phi ratio larger or smaller than its adjacent neighbor — ergo fractal.